A multi award-winning box office smash hit in China, this tells the true story of a 2011 incident on the Mekong river in which 13 Chinese sailors were killed by a Myanmar drug trafficking ring. Following a joint operation involving the Chinese, Thai, Myanmar and Laos governments, the film recounts the steps taken to eventually capturing those responsible: a drug-fuelled group of Burmese pirates using child soldiers in collusion with Thai troops. The action flicks from tense, Jason Bourne-style surveillance situations in urban settings before culminating in full-on guerrilla warfare and scenes which borrow from The Deer Hunter. Veteran Hong Kong director Dante Lam is a safe pair of hands when it comes to this kind of high-octane action, with Stephen Tung Wei stepping in on choreography duties during the rare moments when the action gets physical. Although this is a Chinese film, it does take a cursory look at the wider geographical, social and economic ramifications of the drug trade in the Golden Triangle and its impact on surrounding communities. The drug wars are personalised via the character of Fang Xinwu (Eddie Peng), a field-based narcotics officer whose heroin-addicted ex-girlfriend takes her own life. But Dante Lam never loses sight of the brief, keeping the action steady and engrossing over a long running time with cars being flipped, explosions all over the place, and lots and lots of running. Crucially, it gets its message across without being too burdened by its own portent. Meaty stuff. 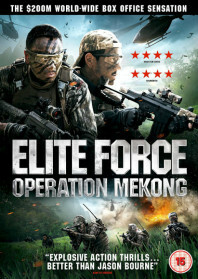 AKA: Elite Force: Operation Mekong. Elite Force: Operation Mekong is available now on VOD and DVD from Cine Asia. Watch now on Amazon and iTunes.